The labor of black workers has been crucial to economic development in the United States. Yet because of racism and segregation, their contribution remains largely unknown. 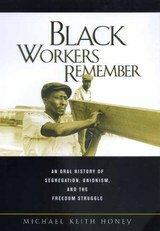 Spanning the 1930s to the present, Black Workers Remember tells the hidden history of African American workers in their own words. It provides striking firsthand accounts of the experiences of black southerners living under segregation in Memphis, Tennessee. Eloquent and personal, these oral histories comprise a unique primary source and provide a new way of understanding the black labor experience during the industrial era. Together, the stories demonstrate how black workers resisted racial apartheid in American industry and underscore the active role of black working people in history. The individual stories are arranged thematically in chapters on labor organizing, Jim Crow in the workplace, police brutality, white union racism, and civil rights struggles. Taken together, the stories ask us to rethink the conventional understanding of the civil rights movement as one led by young people and preachers in the 1950s and 1960s. Instead, we see the freedom struggle as the product of generations of people, including workers who organized unions, resisted Jim Crow at work, and built up their families, churches, and communities. The collection also reveals the devastating impact that a globalizing capitalist economy has had on black communities and the importance of organizing the labor movement as an antidote to poverty. Michael Honey gathered these oral histories for more than fifteen years. He weaves them together here into a rich collection reflecting many tragic dimensions of America's racial history while drawing new attention to the role of workers and poor people in African American and American history. Michael Keith Honey is Harry Bridges Chair of Labor Studies and Professor of African-American, Ethnic and Labor Studies, and American History at the University of Washington, Tacoma. He is the author of the prize-winning Southern Labor and Black Civil Rights: Organizing Memphis Workers (1993).